Section 1502 of the Dodd-Frank Wall Street Reform and Consumer Protection Act requires that companies, whose products may contain conflict minerals, file public reports about their supply chains that address minerals sourcing in their products. If, after companies have investigated their supply chain, the company realizes that their minerals originate in the Congo or its bordering countries, they must also issue a report reporting their due diligence. By May 31, 2014, it is expected that companies will be required to take the unprecedented step of submitting their first conflict minerals disclosures to the Securities and Exchange Commission, or SEC. 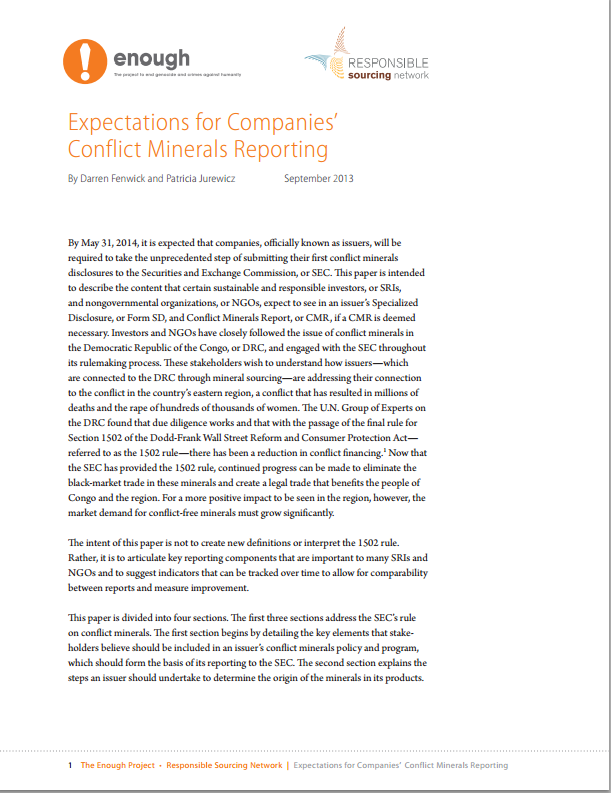 Today, the Enough Project along with the Responsible Sourcing Network released a report,”Expectations for Companies’ Conflict Minerals Reporting”, that articulates key reporting components that are important to socially responsible investors and rights groups who have been advocates for a clean minerals trade. Building a clean minerals trade by 1) Committing to sourcing conflict-free minerals from Congo and the surrounding region; and 2) Implementing OECD due diligence processes to determine if an issuer’s minerals are contributing to conflict. Stakeholders also expect issuers to include any initiatives or activities they are undertaking or will undertake to support a clean minerals trade in Congo. The report also encourages issuers to take compliance beyond the 1502 reporting requirements, and to help create a peaceful and secure Congo by participating in diplomatic efforts and contributing to alternative livelihood projects in the region.